Trees — they are everywhere, right? Well, guess again. According to the recently released Miami-Dade Urban Tree Canopy Study, in Miami-Dade County we only have 20 percent tree canopy—which means only 1/5 of our land is covered in nice cool shade. Yet, who needs shade more than Miami? With our extreme weather, heat, and humidity, trees provide a welcome respite. By cleaning our air, reducing our storm water runoff, and decreasing our energy consumption, they also take a serious bite out of climate change. 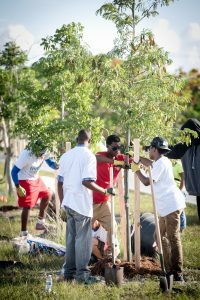 Conducted by University of Florida and Florida International University researchers, the Urban Tree Canopy Assessment not only captures Miami-Dade’s tree canopy data, it also shows which communities have the most opportunity to plant more trees and which are running out of room to plant trees. Thus, we have the beginnings of a blueprint to help show us which communities need the most trees and which have the most opportunities to plant trees. Whether you are Medley with a 5.5 percent tree canopy or Coral Gables with 46.7 percent tree canopy, you can target future plantings in those areas that most need them. Think about being outside on an August afternoon like today. Where do you gravitate? Under a tree. The study also shows the impact of trees on our surface temperatures. Indeed, the more trees you have in a community, the cooler it’s going to be. Currently, those communities lacking adequate tree canopy tend to be the lower income, minority communities – which means they are not experiencing all of the great benefits of trees. 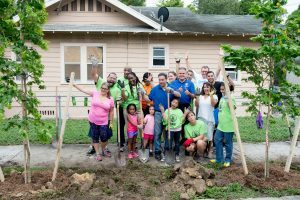 Neat Streets Miami Chairman, Miami-Dade Commissioner Dennis C. Moss, is working to change this reality by securing funds for the Miami-Dade Street Tree Matching Grant that enables communities to plant more street trees with grant funds. Furthermore, the County and Knight Foundation recently convened a group of community leaders who are developing a Strategic Plan to elevate the Million Trees Miami initiative. 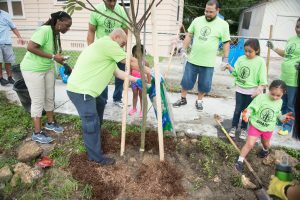 Launched by Neat Streets Miami in 2011, the Million Trees Miami campaign is focused on planting one million trees and achieving a 30 percent tree canopy in the county by 2020. Now that we have completed the Urban Tree Canopy Assessment, we have the foundation from which to make our future tree planting decisions. Check out the study, take a look at our maps, and see where your community needs the most trees and where you can plant more. Finally, please visit milliontrees.miamidade.gov to see how you can help get more trees in the ground.